We are a unique entity in this industry, actively committed towards manufacturing a premium quality range of SS Work Table.In order to cater the variegated demands of our clients, we are offering an excellent quality range of Commercial SS Working Table. 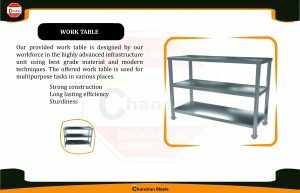 For reasons of quality maintenance, the offered range of Work Table With Two Under Shelves is manufactured in accordance with the set industry norms and guidelines, utilizing the finest raw materials and modern machines. Owing to this, the offered range has a superior sturdiness, durability and resistance to corrosion.